Footer Layout: Choose your footer layout boxed or wide. Back to Top: You can Enable/Disable back to top icon. Hidden Footer: You can Enable/Disable hidden footer. This option set footer fixed at bottom of the page. When scroll end of the page then only it’ll show. Footer Skin: Choose your individual skin setting for footer. 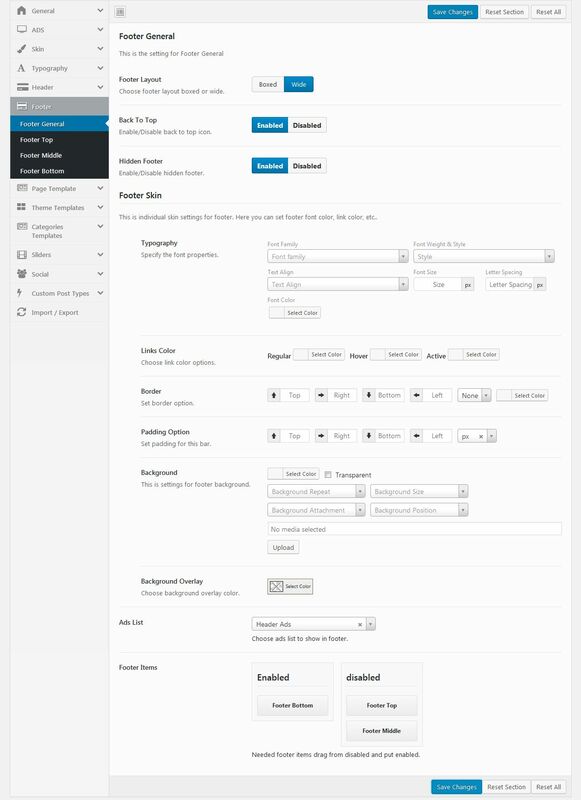 You can set for footer like typography, background color, link color options, border option, and padding option. Background Overlay: Choose your background overlay color. Ads List: Select your ads list to show in footer. Footer Item: Needed footer items drag from disabled and put enabled. We just split into three parts like footer bottom, top, and middle. You can place any widgets in those three parts.